It's time for Throwback Thursday! I have one of the first Zoya polishes I ever owned to share with you today. I believe I bought this one during a sale when I first started getting into nail polish. I actually have no idea what collection this one came with, or if it even came with a collection at all. I think this color is just that old in nail polish years. 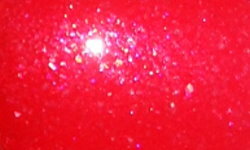 Milla is a soft red jelly base with a red/pink and silver glass fleck glitter. Color: This is a perfect color for summer. It reminds me of a cherry slushie or something of the sort. This has that perfect combination of a jelly and glass fleck glitter/shimmer from nail polish history past. I love polishes like this and Milla is so rich and juicy. Formula: The formula on this is easy to use, but a bit sheer. I needed 3 coats for full coverage. Price: This one has been discontinued by Zoya, but you can still find it on etailers in the $7-$8 range. Overall: Milla is a great blast from the past polish. I love the squishy and jelly look of this color and the glass fleck glitter has me yearning for more.